If you haven’t heard the name Khalid in the past few months, then you have obviously been living under a rock. This American Teen has been taking this world by storm. At 19 years old, he’s done more than your typical teenager. Khalid has been giving us hit after hit with his album American Teen. Being so young, he wound up releasing his music while he was still a senior in high school. While most people are focused on prom and graduation, here he is writing and recording a whole album, and then right after being on a crazy tour across the country. Mind-blowing! He has also featured on plenty of different tracks with artists like Logic, Marshmellow, and Alina Baraz. 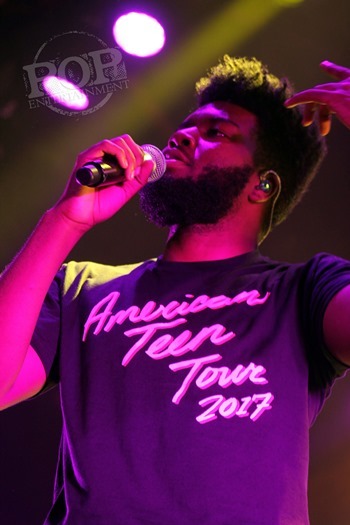 At the recent sold-out show at the Fillmore in Philadelphia, the crowd was stoked to see Khalid. All day, people were lined up in the streets, trying to make sure they got the best spot to be up close and personal during the show. Fans had taken over the Fillmore, so excited to see the show! Without an opening act they had a local house DJ come and spin music for the first hour. The DJ played the hottest hits of today, which got the crowd pumped and ready for Khalid to come on stage. After a few songs, some of Khalid’s friends and management team came on stage with water guns and began jumping around to get the crowd even more exhilarated! At around 8:30, the lights shut off. The stage screens started lighting up with colors. Slowly the flashing name Khalid appeared making the crowd erupt with screams. After a few minutes of a light show the illuminations completely shut off and the man himself ran out onto stage. The song “American Teen” started to play, with the crowd singing the words right back to him as he performed. The energy he was giving was crazy high! Then again, the crowd was giving it right back to him. Following up after that he continued with his upbeat hits like “Another Sad Love Song” and “8TEEN.” Each song continued to have wild energy. He also busted some great dance moves why he was performing. The crowd really loved that! Around the second song, he also brought out some background dancers to really get hype! After some high energy songs, he then proceeded to slow it down a bit with sad heartbreak songs like “Saved” and “Cold Blooded.” You could feel how much the crowd was into his songs. You could see on the fans faces how much they could really connect with his music, and relate. He really is an artist that tries to put the best music out there for his fans. After everyone got deep into their feels, they picked it up in the end with his hit songs “Location” and “Young Dumb and Broke” to end the night. Everyone was up on their feet, jumping to each beat, singing every note, not missing any at all! The night drew to a close with a massive confetti spray in the air. By the end of the night, the fans were super exhausted from using all their energy while Khalid was performing. He put on an amazing show, that drew everyone close to come out and see it! He really knows how to put on a show for his fans, and how to relate to them. I would love to see him again. Copyright ©2017 PopEntertainment.com. All rights reserved. Posted: August 13, 2017. Tags: 2017, 8TEEN, Alina Baraz, American Teen, Another Sad Love Song, August 11, Cold Blooded, Concert Photo Album, Concert Photography, Concert Photos, concert review, Khalid, Location, Logic, Maggie Mitchell, Marshmellow, philadelphia, PopEntertainment.com, Saved, The Fillmore, Young Dumb and Broke. Bookmark the permalink.